Beans are full of so much nutritious goodness that the U.S. Department of Agriculture considers them both a protein and a vegetable. Kala chana, also known as the dark chickpea, is a savory bean popular in India and very similar to the yellow chickpeas at your grocery store. Like other beans, kala chana is full of protein, fiber and iron, and makes a healthy and colorful addition to any meal. 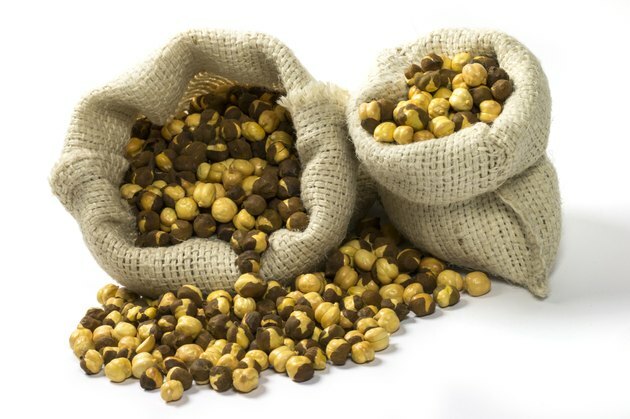 Kala chana is dark brown and smaller in size than the yellow chickpeas. One half cup of dried kala, which yields about 1 cup cooked, has 360 calories, 5 grams of fat, 60 grams of carbs, 17 grams of fiber and 19 grams of protein. While these beans are high in protein, more than 60 percent of the calories come from carbs. As a source of energy for your body and brain, most of your calories -- 45 to 65 percent -- should come from carbs, according to the USDA. Although not a complete source of protein, the amino acids in the beans contribute to making hormones, muscle and enzymes. Adults need 46 to 56 grams of protein a day, and half a cup of dried kala chana meets more than 30 percent of these needs. Beans like kala chana are considered both protein and vegetable because they are a rich source of vitamins and minerals present in both food groups. These savory beans are rich in calcium and iron and can help you get more vitamin C in your diet. A half-cup serving of the uncooked bean meets 40 percent of the daily value for iron, 11 percent of the daily value for calcium and 7 percent of the daily value for vitamin C.
Certain groups of people, mainly children and women, have a hard time getting enough iron and calcium in their diet, according to the Office of Dietary Supplements. Iron is essential for delivering oxygen to all the tissues in your body, and calcium is necessary for bone health. The vitamin C in the bean improves bioavailability of iron, which means it helps you absorb more. If you're looking for a reason to add more beans like kala chana to your diet, look to your health. People who eat more beans tend to live longer, according to a 2014 review article published in The American Journal of Clinical Nutrition. This may be due to the fiber content in the bean, which has been shown to help improve blood sugar and lower cholesterol, decreasing risk of chronic illnesses such as diabetes and heart disease. Making beans a regular part of your diet may also help with weight control, according to a 2016 review study from AJCN. This study found that including beans regularly helped even those not following a weight-loss diet to lose more than half a pound over a six-week period. Cook 1 cup of dry kala chana beans in 3 cups of boiling water for 60 to 90 minutes. Once cooked, use the beans as you would regular chickpeas, adding them to soup or salad, or mixing with your favorite grain. Kala chana is a good bean for making chana masala, which is a curried chickpea dish popular in Indian cuisine. The beans also stand well on their own and can be sauteed with garlic, onions and peppers for a delicious side dish. Or, use the bean to make a dark hummus.